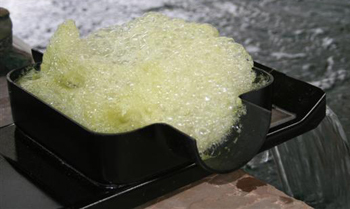 The effectiveness of traditional Protein Skimmers or Foam Fractionators in fresh water is restricted by the lower density in fresh water and therefore the ability to form small enough bubbles with enough surface area to attract the organic waste. Since the Clarity Protein Skimmer is based on an entirely different approach, the Clarity protein Skimmer does not have this limitation. This results in superb efficiency also in fresh water and opens up many exciting applications for the Clarity Protein Skimmer. The Clarity Protein Skimmer Regulates the level of oxygen in water. During the normal process of feeding fish and decomposing of organic matter, the level of oxygen in the water is altered. These environmental changes are not desirable for the fish and result in increased stress and unhealthy conditions. Clarity protein Skimmers mode of operation restores the balance of oxygen in the water as part of the process of making the foam. The Clarity Protein Skimmer Breaks down ammonia and nitrite to nitrate before foaming. As the water trickles down the Clarity Protein Skimmers airing tower , bacteria fastened to bio-rings decompose organic compounds to simpler, less toxic substances. The most important example of this process is the breakdown of ammonia to nitrite and eventually nitrate. This lowers the toxicity of the compounds and results in a more effective removal of organic compounds. Ozone treatment can be combined with the Clarity Protein Skimmer which results in stable water conditions in spite of great variations in the quality of the incoming water. The Clarity Protein Skimmer is low maintenance. 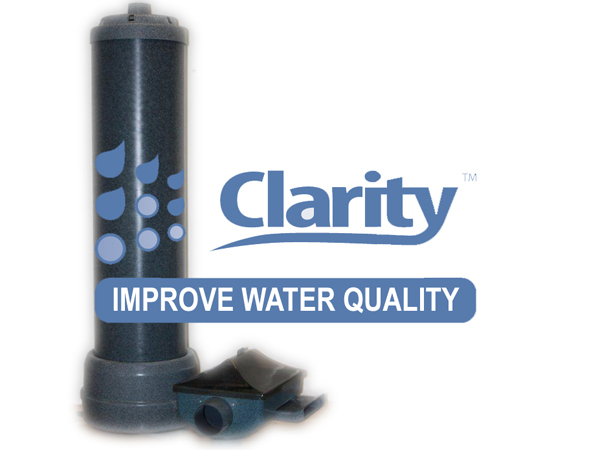 The Clarity protein Skimmer is easy to install and can run for several months without any maintenance (dependent on the quality of the feed water). Since there are no moving parts and thus no wear and tear, the Clarity protein Skimmer has a long life span, increasing the financial investment in this unique Protein Skimmer / Foam Fractionator.